I have never been on Holiday outside of the UK so my favourite places probably aren't the most interesting but they old great memories for me. 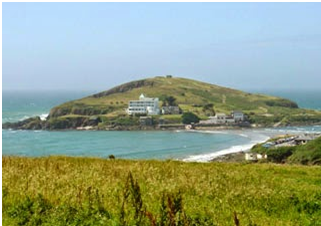 One of my favourite places is burgh island on Bigbury beach in Devon, I love this place because me and my family used to go to Devon every year for our holiday. The beach is beautiful and when you are standing on the top of burgh island and looking out, its like you forget about everything and the view is just breathtaking. The beach is lovely and we had so much fun there, it sounds childish but we used to make mermaids and sharks out of the sand and pebbles, and this is one of my best memories. My second favourite place is Dartmouth which is in Devon. I really love this little town because it has really cute shops hidden away down little roads and its on the river dart which is really lovely. the other reason why I love this place is because when I was little me and my family went crabbing there (Sounds boring but for a six year old it was quite fun.). Now this didn't really go to plan as when my aunt told me to throw the line in, I took that to me throw the hold thing in and lost my line. Now because my family are so lovely and probably didn't want a six year moaning at them they got me another one but made sure I wasn't stupid enough to throw the whole thing in. Its memories like this that make these places my favourite because I spend my Holiday with all the people I Love most in the world and have great memories of all the places we have been together. Below I will put a few pictures of the places, these aren't my own pictures because I didn't have very good ones so I got them of Google, sorry. Hope that didn't bore anyone to much but I thought I'd share the places with you.